Tynwald is set on 40 acres and is a stunning 1830's mansion with magnificent views of the serene Derwent River. There are two lovely garden walks and, within the grounds, there's the ruins of the flourmill a mill dating from 1820, the first flour mill in the district. Furnishing all rooms with genuine antiques has skillfully retained the rich history of this elegant house. However, modern comforts are all supplied including a spa in some rooms. The Granary, originally built in 1822, was the grain store for the old mill. It now functions as a self-catering, quaint stone cottage of two stories, one bedroom, double + single, lounge, shower & full kitchen. Our facilities include Outdoor In-Ground Pool, Tennis, Licensed Restaurant, 20 minutes walk to wide variety of in New Norfolk, Riverside walks and fishing, Carafe, glasses, Tea and Coffee making facilities in each room, TV in the main lounge, with complimentary portable TV available on request, Hairdryers, Ironing facilities in Tower Room, Laundromat nearby, Good Fishing available subject to readily available license, mountain Bikes available, Jet Boat rides nearby, we can book for you. Owner operated by qualified chefs ensures personalized service. You can enjoy fine dining & the ambience of an elegant, more relaxed era. The licensed a la carte restaurant features fresh local produce, such as game meats, cheeses, vegetables and all the berry fruits you can think of. An excellent cellar, with an emphasis on quality Tasmanian wines. Named after our own Derwent River, which flows from Lake St Clair to Hobart and provides a commercial and recreational waterway as well as irrigation and town water for a large part of Tasmania's population. 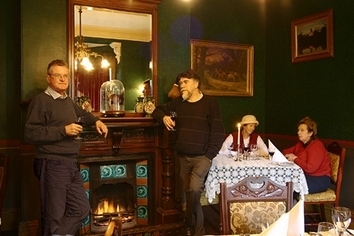 Our Derwent Room provides the luxury of your own spa suite, antiques, and the peace of historic Tasmania. Derwent is our spa suite, located on the first floor with access to the verandah. The River Gordan, historic towns from the Midlands to Pontville rely on its waters and it joins the Derwent about 8km upstream from the city of Hobart. Several of the rooms, like this one, access the expansive verandah of Tynwald Mansion directly, and give you access to the wide views of open countryside adjoining the picturesque Derwent River. Our 'Studio Apartment' offers self contained living and very cosy bedroom, will cater to the needs of three people very nicely. You get full breakfast, you can park your car at the door, and you're on your own. Unless you want to come over to our restaurant for dinner, and of course you're welcome to join us in the kitchen for breakfast - but you don't have to! Pet friendly Apartment. Maximimum Occupancy 3 Guests. This room is called Lachlan after a pretty river valley in the hills to the South West of New Norfolk. Lachlan has it's own facilities, and is ideal for a couple. Lachlan is also on our ground floor, just down the hall from our lounge and the restaurant, so access is easy for anyone who cannot negotiate stairs. Macquarie is located on our ground floor and also features easy access without stairs. It has an ensuite shower room and bright decorations. Ground floor spa room, overlooking waterfall in garden. Ideal for a romantic setting. Small conferences can be catered for. All rates based on the maximum occupancy of 2 guests per room. The Granary Studio is pet friendly, please bring your own bedding - there is no enclosed yard. We're just 30 minutes from Hobart, with a scenic drive all the way beside the River. Yet only 40mins to the World Heritage areas, a great place to use as a base to explore.Four hours from Tasmania's West Coast & 45minutes to the airport. New Norfolk is one of Tasmania's earliest towns with convict heritage. The peaceful scenery outdoors lead to a wetlands park and sanctuary for many birds, and also to the esplanade of New Norfolk 2km away. If you feel a little more energetic, there is a solar-heated pool, a tennis court or mountain bikes supplied by your hosts. You can borrow some fishing rods and try your luck, just beyond the front door. Or just relax by the crackling fire with a book, or soak away all your tension in one of the double spas. Visit the salmon ponds, local wineries, jet boating or Mt Field National Park.